What type of vacationers are we? My wife and I are not world travelers. I’ve been all over the U.S. and on a few international cruises. We’ve realized while traveling that we don’t like having much of an agenda. I like to explore things when I’m on vacation, but we’re not overly adventurous (we don’t climb mountains or bungee jump). I do. however, like to put myself in situation a little bit outside my comfort zone. One other thing I’ve realized is that my traveling preferences have changed as I’ve had children and as my children have gotten older. How long is too long for a vacation? We realized after three weeks of being gone that it was too long for us to live out of a suitcase, especially with Sarah still in diapers. It takes me 2 days just to calm down and relax from my daily stresses. I think our sweet spot for travel might be 9-14 days. Is it easy to stay connected? Internet connections sucked everywhere except in Americanized hotels. There was no cell phone reception outside of San Jose. “ICE” is the Costa Rican cell phone carrier, and it’s international roaming, of course. I found that having slow connectivity gave me a reason to work less. In San Jose, the weather was 62-78 degrees each day with low humidity. It’s located in a valley and stays at reasonable temperatures. In Manuel Antonio (southern coast) it’s hotter than hell. Most small hotels don’t have A/C, so make sure you get one fully equipped. What are the natives like? 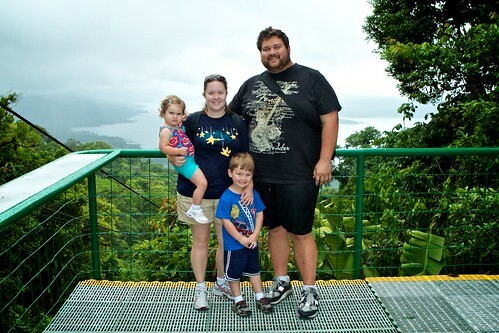 We found the locals (or “Ticos”) to be nice, kind people and very sweet towards our kids. 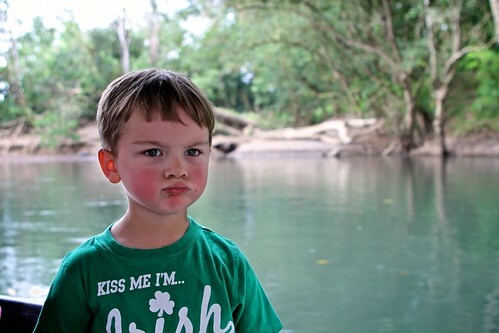 I was told most Costa Ricans are almost white in skin color and some have green eyes. Some tico have heritage with Spanish and Chinese. The black people in Costa Rica came from Jamaica, and they came to build the railroad. The darker-skinned Ticos have other Central American heritages in their blood line. The free breakfasts at the hotels were usually pretty good. TONS of fresh fruit and always beans at every meal. Also, you can drink the tap water. Costa Ricans are proud of their beer, Imperial. But don’t tell them it tastes like Corona. Should the driving conditions scare me? First, if you’re driving in Costa Rica, GET A GPS. We would have been SOOOO lost without our GPS. 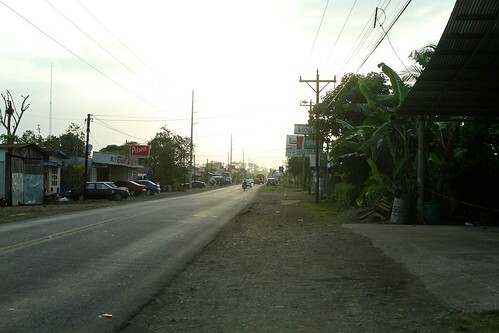 Costa Rica has no street addresses, and the drivers are insane. Atlanta during rush hour doesn’t hold a candle to this. You can take shuttles between resorts and airports, but for us, part of the fun was driving around and going to different towns to see new things. The only time I felt unsafe was while driving at night around the bad parts of San Jose. What’s there for kids to do? 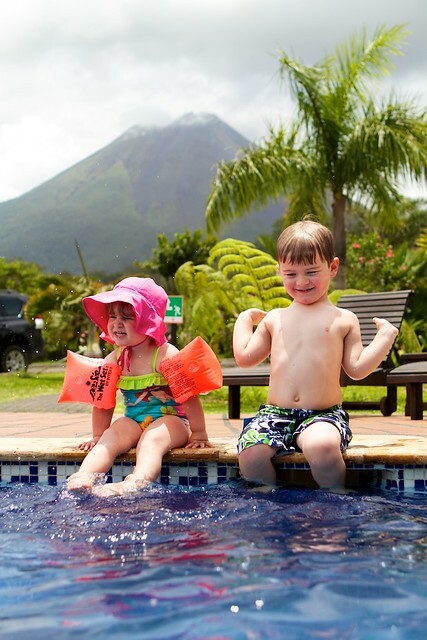 There’s not much to do in Costa Rica for small kids. The age cut off for a lot of activities is 8 years or older. 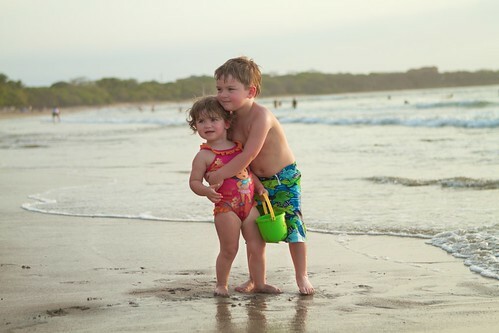 My kids love to spend time on the beach playing in the sand, putting shells in their buckets, digging and exploring. I also learned that my kids will watch Spanish cartoons and stare at the TV as if they understand. We saw a few monkeys, tons of iguana and some toucans. The native Ticos call iguana “tree chickens” because they used to eat them up until a few years ago when they were outlawed. 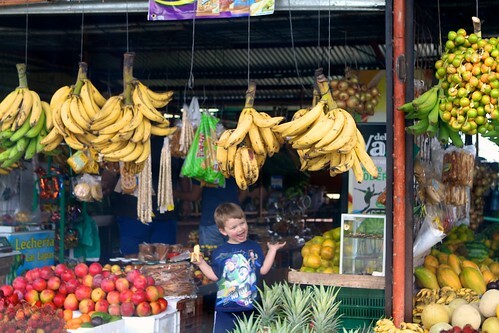 I spoke to a young boy at a restaurant who asked if I liked Costa Rica, and I told him it was different from the U.S. I told him we didn’t have volcanoes, iguanas, etc. He was really surprised which struck me as funny. We bribed a cop with $30 to get out of a speeding ticket. All the cops there ride on ‘80s dirt bikes. You’ll see the police on any major road looking for Gringos to give speeding tickets to. Every restaurant, it seemed, had a hamburger and/or chicken fingers on the menu. Most meals were at least $7 a person, but the food quality was really good. So what’s a “Super Mercado” again? Every small town seemed to have a place you could buy the little things you needed. We only ran into one place where no one spoke English. I used my broken Spanish to get by. Are there different types of hotels? Luxury Hotels – We like cable TV and A/C. Should I take Spanish lessons? I was introduced to a tutoring service in Costa Rica that helps English-speaking visotors learn Spanish. 5 days a week for 6 weeks prior to leaving, I took a 1 hour lesson over Skype. In high school I took four years of Latin. This helped very little when I tried to learn Spanish. The Spanish I learned helped us order food, buy gas, get directions and buy souvenirs. These Spanish lessons were about 12 dollars per hour, so I think I spent $800 on them. I don’t know where we’ll travel next as a family. I think we’d like to buy an RV and travel around the U.S.